The passage and chamber inside the ancient mound at Newgrange are illuminated by the winter solstice sunrise. A shaft of sunlight shines through the roof box over the entrance and penetrates the passage to light up the chamber. The dramatic event lasts for 17 minutes at dawn on a few days before and after the Winter Solstice. 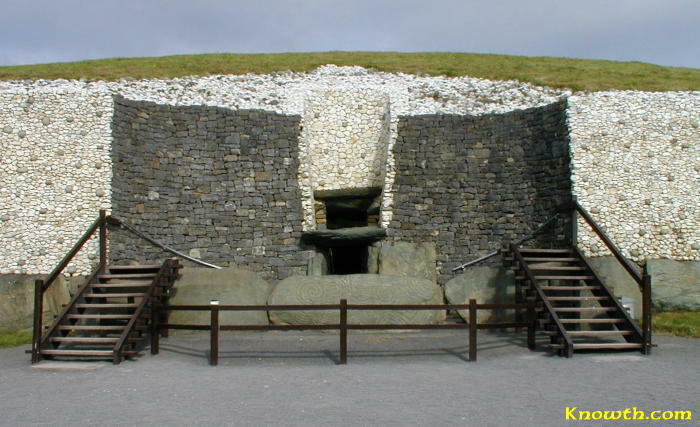 Admission to the chamber at Newgrange for the Winter Solstice sunrise is by lottery. The 2006 Winter Solstice Draw took place on the 29th of September, there were 27,485 applications. Application forms are now available at the Brú na Bóinne Visitor Centre for the 2007 Winter Solstice Draw. 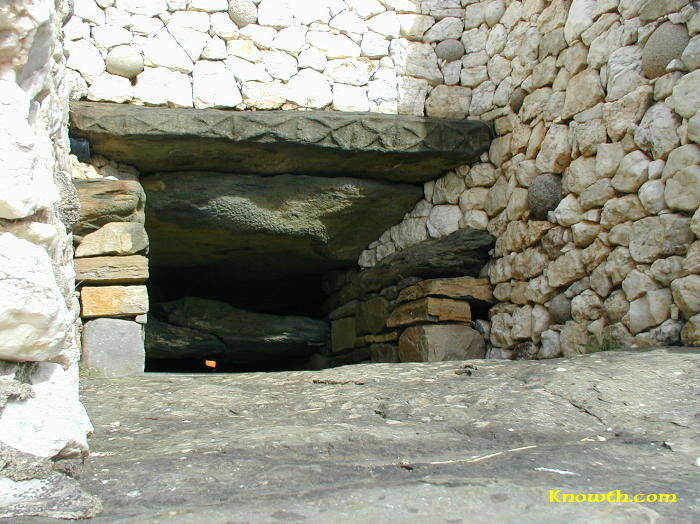 Here is a link to some additional historical information about Newgrange. Bye for now. It's 10.40am and the temperature is 2c outside. Yes, that's 2c, with a freezing pea soup fog that's been hovering for more than 24 hours. It was actually blue sky on Tuesday morning as I walked through the streets of Dundalk, but as I spoke to recruitment agents on the phone from our apartment, the thick fog rolled in over most of Ireland & the UK. You could hardly see out the window! Slightly concerning as we’re flying to Germany on Saturday morning, and a lot of flights are disrupted right now, but it’s supposed to clear by then. So it’s well and truly winter here now. No snow, but the fog has given Dundalk quite a mystical “Christmas” look with the lights shining through the haze and the church bells ringing, really quite lovely. People are very, very into Christmas here. Loads of lights in all the towns (Dublin’s are amazing), all the ladies in town are getting their hair done, and people are buying turkeys. Even the Aldi supermarket about 200 metres from our house sells frozen turkeys, ducks and goose! So, I've made the big move, and I'm settling into daily (jobless) life in the emerald isle with Clare. Yes, I'm an unemployed bum, but it's not that I haven't already looked for jobs. In fact, I was offered a job today, in a vast call centre on the northern edge of Dublin, but I might be a little more selective and make sure I find the right one. I will have to decide. Until then, Clare can keep me in the lifestyle I'm accustomed to. I've already discovered the cheapest supermarket (Aldi), and found an IKEA lookalike computer desk (made in France) that's almost impossible to build. That's how I'm spending my days in the lead up to our cold Christmas in Germany. 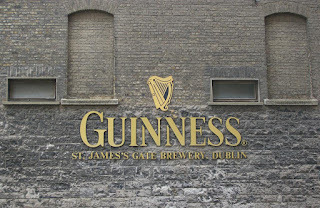 We leave here on 23 December, over to Dusseldorf on Aer Lingus, then spend Christmas with Gerald & Sandra and his parents in Braunschweig, then on to Berlin on 27 December for 3 nights, then back to Ireland on 30 December with Ryanair. Not sure what we're doing for New Years - might be a quiet one, but there's always opportunity for a quiet drink or two in this neck of the woods. Cheers everyone, and all the best for Christmas & Happy 2007!